The Oppo K1 with an in-display fingerprint sensor and a Qualcomm Snapdragon 660 processor is launched in India at a price of Rs 16,990. 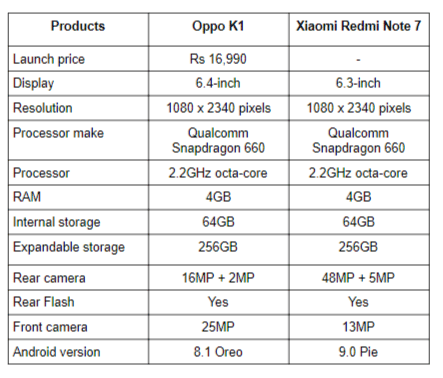 We are comparing the device with the Xiaomi Redmi Note 7 based on specifications, features, and price. The newly launched Oppo K1 by the Chinese smartphone manufacturer “Oppo” is one of the most affordable devices in the market that features an in-display fingerprint sensor. The phone is launched with a price tag of Rs 16,990. On the other hand, we have the Xiaomi Redmi Note 7, which is expected to make its debut in India this month. The key highlight of the Xiaomi Redmi Note 7 is its rear 48MP camera. Let’s see whether the Oppo K1 would able to give Xiaomi’s latest device a tough competition? At Least on paper. The Oppo K1 has a quite bigger 6.4-inch display that comes with a dew-drop notch on top of it. It has an FHD+ display that offers a resolution of 2340 x 1080 pixels. On the other side, we have the Xiaomi Redmi Note 7 that comes with a slightly smaller 6.3-inch screen that offers a resolution of 2340 x 1080 pixels, same as the Oppo K1. When it comes to the performance, the Oppo K1 is powered by the Qualcomm Snapdragon 660 octa-core processor, which is clocked at 2.2GHz. The phone packs 4GB RAM and 64GB internal memory, which can be expanded to up to 256GB via a microSD card. The Xiaomi Redmi Note 7 is also equipped with the same Qualcomm Snapdragon 660 processor that is clocked at 2.2GHz. The phone is expected to come to India in three variants 3GB/32GB, 4GB/64GB, and 6GB/64GB storage models. Coming to the cameras, the Oppo K1 has a dual 16MP + 2MP rear cameras. This selfie centric device has a 25MP sensor on the front for clicking selfies. On the other hand, the Xiaomi Redmi Note 7 is the first device by the company that has a 48MP sensor on the back, accompanied by a 5MP depth sensor. On the front, the phone has a 13MP camera. 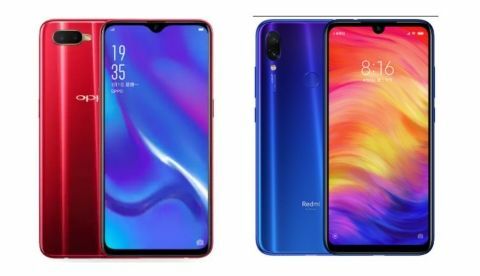 The Xiaomi Redmi Note 7 is launched in China at CNY 1,399, which roughly translates to Rs 14,600. The phone is expected to appear in India in February. However, nothing has been confirmed by the company yet. On the other side, the Oppo K1 is launched in India at an MRP of Rs 16,990.